The Russian president's spokesman has refuted Petro Poroshenko's claims that Ukraine is waging a direct war with Russia, saying that Kiev is at war with Ukrainian citizens. "It is [Ukrainian citizens] that are being shelled, it is them that are being killed. This is probably what we should be talking about," Dmitry Peskov said on Wednesday, commenting on the Ukrainian president's latest interview to the BBC. In the interview, Poroshenko claimed the conflict in Ukraine was a war with Russia. "This is not a fight with Russian-backed separatists, this is a real war with Russia," he said. He referred to the words of two Russian nationals wounded and captured by a Ukrainian volunteer battalion on Saturday, who said they were special forces servicemen. The Russian Defense Ministry confirmed the two individuals had Russian citizenship, and had been in military training and service, but neither was serving in the army when they were captured. The two Russians, who are now facing terrorism charges, are, according to Poroshenko, part of an up to 14,000-strong "Russian force" active in Ukraine: "There are 4,000-14,000 Russian regular army troops in Ukraine at different points in time," he told the media on Wednesday, RIA reports. "This is not just Ukrainian information, it is also from our NATO partners." Last week, Poroshenko told the German TV channel ZDF there were 11,000 Russian troops in Ukraine. He also claims Moscow is sending its tanks and other hardware across the border, saying that shutting off those "supply lines" is the only way Ukraine can have peace. This is not the first time Poroshenko has produced what he said was proof of Russia's involvement. Just before the February meeting in Minsk that brought about the current peace roadmap, he showed up at the yearly Munich security conference with several Russian passports, claiming they were taken from troops captured in Ukraine. The Russian Foreign Ministry asked to see a copy of the passports to check their authenticity, but got no answer. Kiev's claims of a Russian presence have been echoed by several European countries and the US. A "Russian invasion" is described as a fact by many high-ranking politicians, but Moscow has refuted every accusation. Russia points out that the "evidence" Western officials provide to back up their words is impossible to verify and sometimes outright fake. An example of this is a recent Twitter post by the American ambassador in Kiev. In it, he "exposed" a Russian anti-air missile complex in Ukraine, using a two-year-old photo from a Moscow region tech show. In another case, US senator Jim Inhofe claimed there were Russian tanks in Ukraine, using images from the 2008 South Ossetia war. It later turned out the photographs had been sent to him by Ukrainian MPs. Moscow officials, including Foreign Minister Sergey Lavrov, have repeatedly challenged the West to provide solid proof of the alleged invasion, saying that with the sophisticated satellite NATO intelligence systems, it should be easy to detect any Russian tanks crossing the border. No such proof has been provided so far. Russia does admit that its citizens are fighting in Ukraine, but says they are volunteers who went there on their own initiative, not members of the army. The Ukrainian conflict, which is in its second year, has claimed over 6,200 lives according to UN estimates. 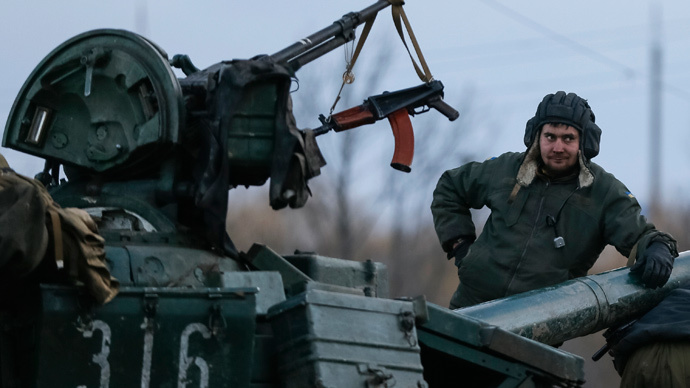 Violence has been on the decline since the signing of the Minsk-2 deal in February. Brokered by Russia, France and Germany, it is a peace roadmap elaborating on a September agreements and outlining what should be done to stabilize Ukraine. Despite the agreement, though, fighting still simmer in the east of Ukraine, and little progress has been made toward a long-term solution.